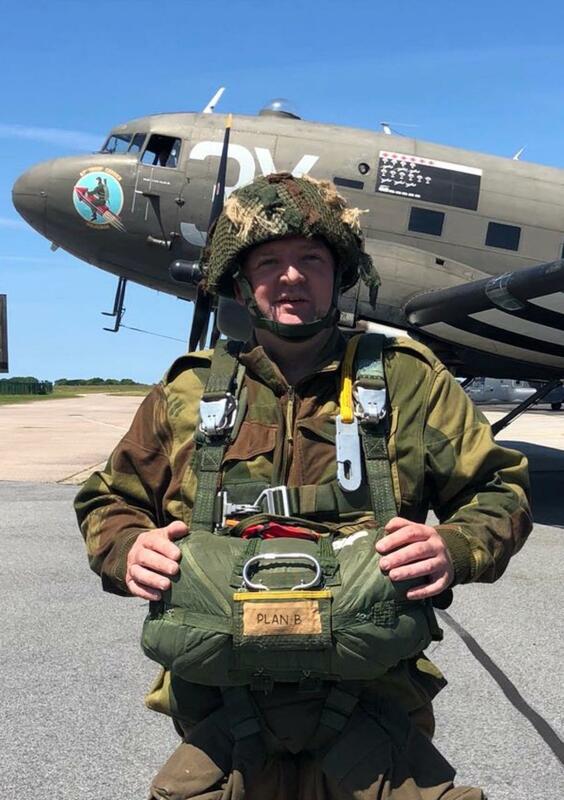 On June 5th 2018, the memorial D-Day reenactment jump at La Fiere was dedicated in George B. Tullidge III's honor. Anne Bell provided copies of A Paratrooper's Faith for all of those jumping that day. Below is a message we received from Mike Gibbons, one of the jumpers that day. The Association of Partroopers that jumped is The Round Canopy Parachute Team. According to Eric Ladourdette of France, they left from the Upottery airport which had not been used for 74 years. This airport was used by the famous Band Of Brother 506 PIR of 101 Airborne on the D day . Thulai van Maanen of the Netherlands arranged a flower arrangement and waited for the jumpers on the dropzone to tell GBT's story to the group. After their jump and after GBT's story the booklets were handed out to the jumpers by 101st Airborne and WW2 veteran Vincent Speranza. After this small ceremony the Round Canopy Parachuting Team placed the flower arrangement at the La Fiere Monument. Thulia left GBT's picture there too. Thulai has been a family friend for many years and shared this wonderful picture with us. This is the monument at La Fiere. This is a message we received from Mike Gibbons of the UK. He was a member of the jump team on June 5, 2018. 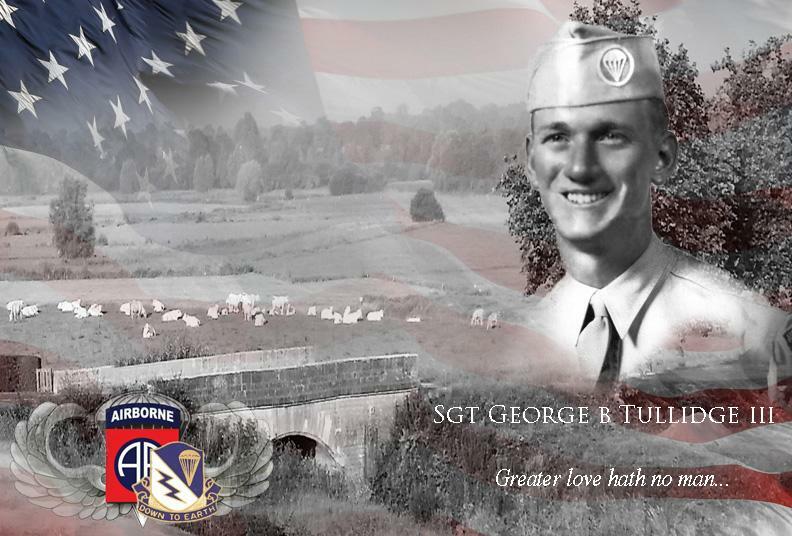 I am very proud to have a link to George B. Tullidge. I was unaware of him and his legacy until the 5th of June this year when I and members of the RCPT (Round Canopy Parachuting Team) jumped into the La Fiere Bridge /St Mere E’glise, Normandy, France DZ , (drop zone) 74 years to the day after GBT and his brave comrades. Afterwards we were presented a copy of “A Paratrooper’s Faith.” In a quiet moment shortly after, I started to read through it and I understood how this small booklet had helped GBT and 1000’s of soldiers in the years and wars since his mother and sister Anne started sending them out. I’m a combat vet myself. I thought of all the lads who had read the words before me and I could imagine the strength and comfort it gave them during difficult times in war and after. I felt I had to contact Anne and thank her and let her know how important I thought this small book was and how it had touched me and alot of my army friends I showed it to. I decided I wanted to visit George and two weeks ago I did. I wrote a few words in a booklet and gave GBT salute. I felt happy to have visited and felt I’d completed a circle I did not know existed a month ago.